I hope you're well - can't believe it's February already! I often see cut or growing herbs marked down in the supermarket and buy them to freeze. Herbs don't need to be blanched or chopped up - just cut them, put them in poly bags and freeze them. I use a poly box to keep them together in the freezer - make sure you label them - a simple sticker on the bag will do. 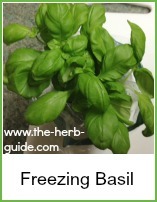 You can use frozen basil in much the same way you would use fresh. 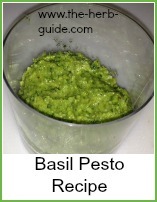 This recipe for basil pesto works equally well with frozen. 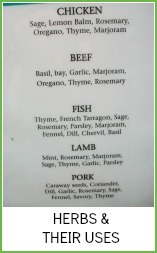 I often get asked which herbs are best to serve with which meat/fish/vegetable. There's no rigid list, but I saw this guide at RHS Wisley when I visited once and thought you'd be interested to see it. If you can't read it properly, then please email and I'll send you a larger photo. I'll see you next month - I have a tutorial prepared which shows you how to test if your old seeds are still viable.